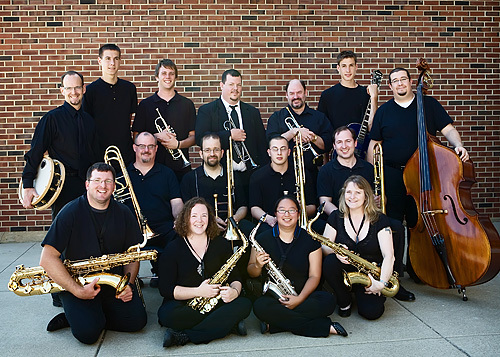 The Rock River Jazz Band is a 14-17 piece Jazz & Big Band Band composed of professional adult musicians and college music students. We play Big Band, Swing, 50-60's Rock, Pop, Waltzes, Polkas, and a little bit of Country. We play music by Big Bad Voodoo Daddy, Earth, Wind & Fire, Stevie Wonder,Louis Prima, Chicago, The Beach Boys, Brian Setzer, Count Basie, Maynard Ferguson, "Dizzy" Gillespie, Sonny Rollins, Kenny Rogers, and many more. The Rock River Jazz Band will play for Wedding Receptions, Corporate Events, Christmas parties, New Year's Eve, Private Events, Outdoor Festivals and just about anything else you can imagine.